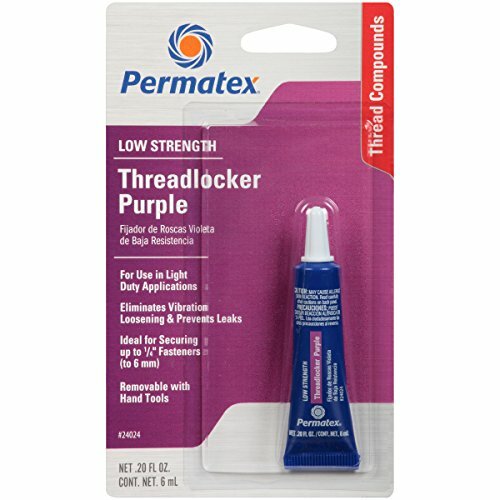 Permatex Low Strength Threadlocker Purple Formula is designed for fasteners under 0.25 inches that require occasional adjustment. This threadlocker is non-corrosive and is removable with hand tools for easy disassembly. Conforms to ASTM D 5363 AN0311 (Mil-S-46163A, Type II, Grade M). Applied as a liquid or gel, threadlockers are superior to conventional lock washers, nylon inserts, and other mechanical devices because they secure the entire fastener assembly against loosening from shock and vibration by filling the space between threaded metal parts, curing to form a tough, adhesive bond and seal. They also seal the threads against leakage, preventing rust and corrosion.